This yellow-flowering perennial is native to Europe, Asia and North Africa, but can now be found worldwide. The name comes from the leaves that seem to be arranged in threes, resembling a flat-footed bird’s foot. In actuality those are just the most visible leaves out of a quintet. The plant will flower until September and will then generate seeds. The plant grows a few inches high to multiple inches, depending on the height of the surrounding plants (mostly grass) and the extent of grazing by animals. 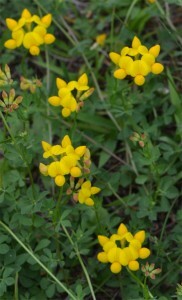 It has been grown for foraging purposes for cattle, and for the fact that it fixes nitrogen in the soil. 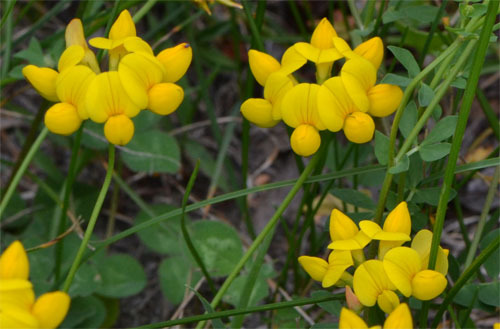 I have found it in my woodland garden, but it barely produces one or two flowers due to the lack of sunlight. Elsewhere, with sufficient light, it grows in massive yellow patches. The plant is poisonous to humans: It contains hydrogen cyanide, which (in small doses) can stimulate respiration and improve digestion. Some say it can be used in the cancer treatments. In large doses it will cause respiratory failure and even death.